The rescue dogs at our Sanctuary are in need of platforms for their kennels. The proceeds from this fundraiser will go towards the carpenter and materials required to build the platforms. 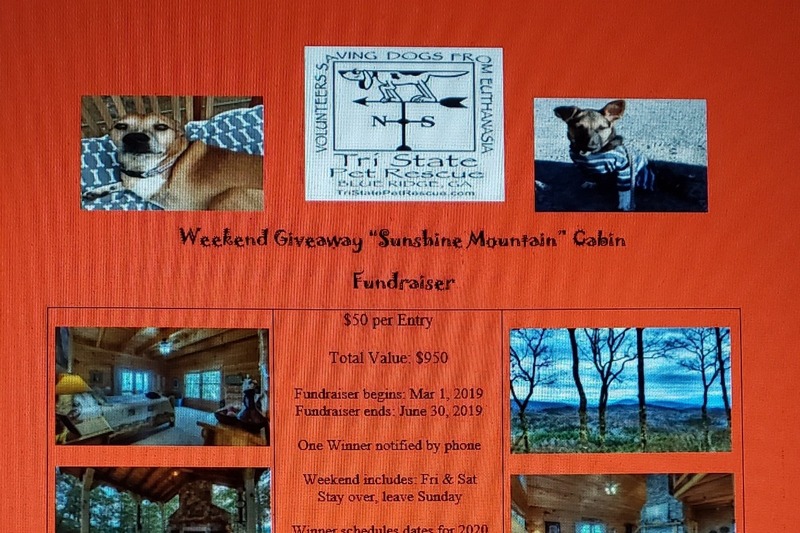 The "Weekend Cabin" is being donated by one of our volunteers to help raise money for this project. This campaign started on March 1 through June 30, 2019. Each $50 donation goes towards a chance to win a Weekend Getaway. (Please review all rules on FB page). Please leave your email or phone number attached to each donation for this Fundraiser. However, any type of donation would be appreciated and acceptable outside of this campaign. More information about Tri State Pet Rescue: We pull animals from local animal shelters before they can be euthanized. They are vetted and then find homes or are transported to our partner groups up north.